Examine important global environmental changes that will affect the future of agriculture! Here is a complete introduction to the influence of global environmental changes on the structure, function, and harvestable yield of major field crops. It gives you an in-depth look at the effects of climate change, air pollution, and soil salinization. The book provides an introduction to the ramifications, both positive and negative, of these ongoing environmental changes for present and future crop production and food supply. 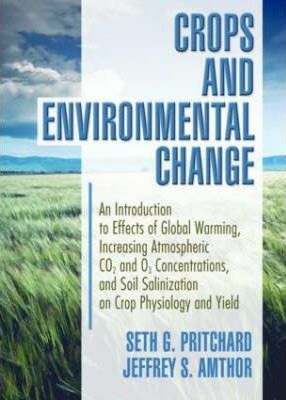 Crops and Environmental Change: An Introduction to Effects of Global Warming, Increasing Atmospheric CO2 and O3 Concentrations, and Soil Salinization on Crop Physiology and Yield integrates a discussion of the physiological effects of environmental change with background information on basic topics in plant physiology. Numerous charts, tables, and figures are included to assist in understanding the empirical effects of the environment on crops. Topics addressed in Crops and Environmental Change include: * the effects of increasing global atmospheric carbon dioxide concentration * climatic changes associated with increasing atmospheric concentrations of carbon dioxide and other greenhouse gases * the effects of increasing ozone concentrations in the lower atmosphere across large crop-growing regions * soil salinization in areas of irrigated crops * the causes and trajectories of ongoing environmental changes * the implications of environmental changes on the future of crop production * and much more! The information in this book is appropriate for newcomers to the field as well as for seasoned professionals. It is written in language accessible to those new to the area and serves as a good jumping off point for more in-depth study. And since it is organized like a traditional plant physiology textbook, it is appropriate for students in the field. For experienced professionals, it acts as a handy refresher/reference tool on the basics of plant physiology. Crops and Environmental Change is a valuable resource for anyone concerned with the future of agriculture. Make it part of your professional/teaching collection today!